The Centro des Bellas Artes (CBA) in Santurce, Puerto Rico has entered the twenty first century, and that took quite a cultural change to achieve. The Bellas Artes administration had the foresight to recognize what was required, and to embed a plan within the tender document that ensured the contract winner had to fully engage with that process of cultural change. "We first knew something was different about this project when we were asked as part of the bid, to fully assemble and run up each of the three audio systems required for the three venues of the Centro des Bellas Artes, here at our shop in New York, prior to shipment out to Puerto Rico," said Michael Cusick, senior sound designer at SAVI in New York, who oversaw the running of the project once the company had secured the bid. "When approached by Daryl Bornstein, the independent audio consultant engaged by CBA, he explained that the pre-assembly would involve full mockup, system debug and test in front of the client. The detailed brief set a very high bar for just how much had to be prepared ahead of time; but their reasoning was very sound. Besides the new technology with which they would have to contend, there was just a thirty day window in which to install all three systems, test and be ready for use. It's important to recognize that CBA is a thirty year old building; as such it doesn't immediately lend itself to a modern audio install, so frankly I'd like to see more clients taking this sort of approach." Josephine Marquez was the owner's representative who attended these trials with members of CBA's sound team, "Michael and the people at SAVI were very thorough. We came away from these preview sessions with complete confidence in the equipment, and the logic of Daryl Bornstein's designs." Bornstein had elected to use all d&b audiotechnik loudspeaker systems for the three venues, with Midas consoles for the two larger rooms, and Yamaha for the smaller black box theatre known as Teatro Experimental. "In short order Bornstein's designs put a d&b J-Series line array system into the 1,875 capacity Sala de Festivales, the largest room," continued Cusick, "A d&b Q-Series system in the 775 capacity Sala de Drama; and Q again in the Experimental, though here the deployment is somewhat unconventional, being a quad arrangement with the addition of a B4-SUB in each corner as well. In fact there is a pronounced emphasis on low end in the Festivales as well, were we have installed four J-INFRA subwoofers at floor level and a sub array of four pairs of J-SUBs across the top of the proscenium arch. 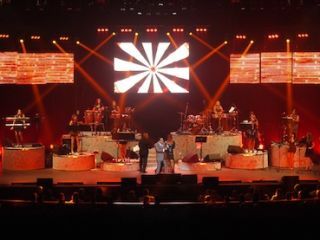 This attention to the low end is determined by the programme material that regularly passes through the doors of the CBA, besides the expected orchestral, operatic and musical theatre, Festivales also hosts many salsa concerts where a rich tonal and potent low end is very much part of the musical recipe. Incidentally, even the Sala de Drama has six of the d&b B4-SUBs, and for much the same reason; here too they produce musical theatre shows with a strong Latin music content." With SAVI based far north in New York, Cusick took advantage of the d&b dealer network and engaged Florida based Carlton Audio to support the project on site, "It made sense for the purpose of equipment service should that prove necessary, though we rarely find it with d&b equipment, and also to have a fluent Spanish speaking audio engineer to assist with the installation process." Carlton provided Rodrigo 'Drago' Hererra, "Drago is a good all round live sound engineer," said Chris Carlton the company founder. "He's very knowledgeable with digital desks and all the d&b range of loudspeakers, as well as being fluent in both languages." "Chris Dietrich led the SAVI installation team on site," continued Cusick. "He was able to take a small team down to the island in October and lay in much of the cable infrastructure and prepare the amp rooms ahead of the physical install which began immediately following the Christmas break. Dark for just thirty days, the theatres all reopened on January 31st. Possibly the biggest advantage that sped the installation was being able to run everything AES digital from the Midas splitter boxes on stage to the d&b D12 amplifiers in the basement below, and just two fibre cables to the consoles in the house, though there are also legacy copper analogue multicores which we ran to the splitters as well. Jason Waggoner came over from d&b's U.S. office in North Carolina and tuned the three systems with us, using d&b's new tuning capture program." The latest d&b ArrayCalc V6.7 contains an export function from the simulation software enabling the settings to transfer directly to a project file in the d&b R1 Remote control software. "From virtual optimization in ArrayCalc simulation to verification of settings is almost immediate. Then Jason helped us with some minimal fine tuning in the real world of the hall. We find we rarely have to touch the 4-band parametric built into the D12 amplifiers; here we used a couple of filters, otherwise totally flat." Dietrich stayed on site for the following month; "The second part of the client specification that addressed cultural shift was the training regime. We ran some pretty intense one-on-one and group sessions for the Midas Pro6, and taught them how to build a variety of show templates for the major styles of anticipated presentation. It also gave us the opportunity to get the whole house sound department conversant with the full potential of the d&b systems capabilities."